If it had been a movie, it would have been Clash of Titans but it’s still a clash of the power couples! 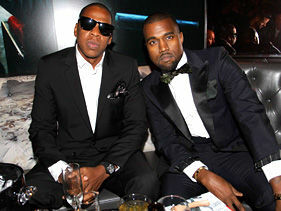 Ghbase.Com has found out that Jay Z and Beyonce have ceased all contact with his buddy Kanye West and his bride Kim Kardashian, who had spent the last two years pushing to get closer to the stars, an insider revealed to OK.
“When the rappers were on tour, Beyonce was forced to sit with Kim at shows and hang with her after, and she put up with it through gritted teeth,” says the source. Now the newlyweds have even been spending more time at their New York apartment, just two blocks away from Jay and Beyonce’s home there, in a bid to get North to Bond with Blue Ivy. However, the insider says the superstars are fed up with being associated with the Kardashian brand. Do you think that the feud between BeyJay and Kimye is real? Do you want Blue Ivy and North to be friends?! Tweet us @oficialghbase or comment your opinion below.